I will always have a special place in my heart for budget friendly hardware. No matter how long I’ve been at this, I always seem to be the most excited for the component that hits the price/performance sweet spot. In that regard, ROSEWILL has impressed me on numerous occasions with such releases that maintain a very good quality as well. While scanning Twitter, I saw a glimpse of a case that I thought was a new design and after a quick email, my suspicions were confirmed. The Cullinan is a new mid-tower design that features a slick tempered glass finish on the side and front panels. In one shot, the LED lighting looks like something out of Star Trek. The case has an extremely elegant look to it while also being able to support an impressive amount of liquid cooling components. I can’t wait for more details on that, as well as some new Titanium rated PSUs (Tokamak) and a new RGB mechanical keyboard. Below is the full press release so you can catch up on a few more details. Rosewill, a leading manufacturer of PC gaming gear, PC components and consumer electronics, has selected Computex 2016 to unveil the latest additions to the company’s expanding product lines, and will also introduce the company’s new gaming series logo, Rosewill Gaming. 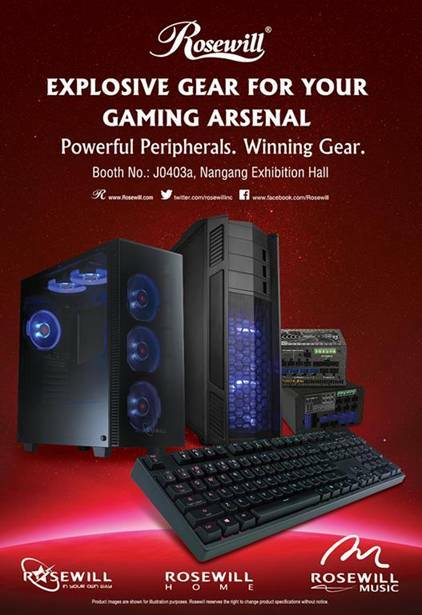 Rosewill’s products will be on display at the annual event held from May 31 – June 4, 2016, in Taipei. Rosewill’s newest gaming products are guaranteed to maintain the company’s reliable and high quality attributes, while featuring new, stylish ascetics. Rosewill will be showcasing its case and PSU segments, as well as its new TOKAMAK series titanium efficiency power supplies, which made a brief debut in 2015 as a prototype. This new product series will be available this year in third-quarter 2016. In addition, the new CULLINAN mid-tower ATX case will be on display. This case features a tempered glass design, crafted to highlight rig components, and also supports up to 420mm GPU cards and 360mm liquid cooling solutions. Lastly, Rosewill will also showcase its RHAF-16003 1800W oil-less low fat air fryer. This new air fryer is outfitted with a 5.8 quart (5.5 L) non-stick food basket with LFGB and FDA and features hot air circulation technology and a cooking timer up to 30 minutes and a temperature control of 170-400 degrees F.
Rosewill will be located at the Nangang Exhibition Hall, Ground Level (1F) in the Components and Parts area, at Booth J0403a. For more information about Rosewill’s various product lines, please visit http://www.rosewill.com/. Rosewill Inc. was established in 2004 under the supervision of experienced e-retailer experts. The first products under the Rosewill brand name included computer components such as computer cases, power supply units, keyboards, mice and cables. Over time, the product line expanded to new areas of growth, including information technology and consumer electronics, and became available on a multitude of top-tier retail websites. For more information, please visit http://www.rosewill.com/. No it doesn’t, it looks like a fractal define.